3D fileSpace 1.5.2 is available! Buy now | Download (1.5 MB) v4.4.2 for Mac OS X 10.6 to 10.14 or newer. Free trial, $14 single user license. Smart Scroll 4 is a free upgrade for users who have already upgraded to 3.9. If you didn't upgrade to 3.9, you can upgrade to 4.x instead, for the same $7. 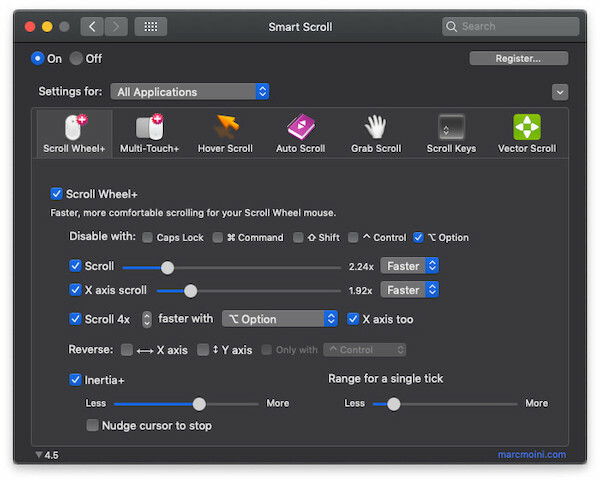 Smart Scroll 3 is still available, up to OS X Yosemite: Smart Scroll 3.9.22. Scroll Wheel+ Multi-Touch+: smoother, more comfortable and/or faster scrolling for your trackpad or mouse. Try it! Improves even the latest trackpads and mice. Other features include independent reversal of trackpad and mouse, trackpad and scroll wheel acceleration, and more. Amazingly smoother scrolling, much easier for reading than the built-in scrolling. Free-flowing, smoother scrolling that is more comfortable for reading, because it makes it easier to follow the page. Coasting - uses the momentum of the moving page to let you zip through large documents faster and with less effort, as on the iPhone. Simply point the cursor to the top or bottom edge of a scrolling pane to scroll. Move closer to the edge to scroll faster. To show the zones where Hover Scroll responds, hold the option/alt key and move the cursor. You can drag these zones to position them in each application. Use the Left/Right arrow keys to adjust speed on the fly. Scroll back with the Up arrow key, and use the Down arrow key to skip forward. If needed, click or hit any key to stop scrolling while the cursor is in the hover zone near the edge. To scroll again, move the cursor out of the zone and back in again. You can choose how far from the edge scrolling occurs, and you can set the highest speed to scroll at, when the cursor is closest to the edge. These settings can be customized for each application. Read more comfortably, hands-free! The page scrolls automatically. Tap your chosen hot key then sit back and relax while the page under your cursor scrolls automatically to keep up with your reading. If you need to adjust the speed, or scroll back up, or skip forward, use the arrow keys as with Hover Scroll (see above), or you can also move the cursor up/down. With iPhone-like coasting, scrolling through multiple pages becomes as easy as grabbing the document and gently "throwing" it in the direction you want. Grab Scroll works with any kind of mouse, pen & tablet, trackpad, trackball... With a 2-button mouse, set it to use the secondary button and you can then click-and-drag to Grab Scroll, or click without moving the mouse to get the usual "right-click" menu. With 3 buttons, you can click-and-drag with the middle button to Grab Scroll, or click to open links in a new tab or to perform any other action that does not involve dragging--not Dashboard or Exposé. You can also use a hot key to trigger Grab Scroll. With a Wacom pen, set the pen button you want to use for Grab Scroll to generate a key combination, then set that same key combination as the hot key trigger for Grab Scroll. Scroll Keys let you scroll from the keyboard in all applications, with only one set of keys. This gives you consistent, dependable scrolling everywhere, without having to remember which application uses which keys and without having to reach for the mouse. Hold down the key, then tap the key once. To scroll another line, just tap Command again (while still holding down Control ). After scrolling once, you can keep both keys down to keep scrolling. If a window has two or more scrollable panes, it is the one under the mouse pointer that scrolls. Because these keys are conveniently located in the corner of the keyboard (both corner on some keyboards), you can scroll without even having to look at the keys. You can choose your own preferred combinations of these keys. Scroll Keys also feature an adjustable scrolling speed, with optional progressive acceleration, so that you can easily scroll multiple pages simply by holding down a key. Popular with Windows and Firefox users, now available for all Mac apps! Click and then simply move the cursor in the direction you want to scroll. The farther you move from the anchor point the faster the page scrolls. It's also known as "rubber-banding". You can use Vector Scroll to scroll hands-free, nudging the cursor when you want to adjust the speed. To stop, click or hit any key. Thanks to Eden Sherry for permission to name the Grab Scroll feature after the popular Scrollability feature. Thanks to Eden Sherry again, and to Catchy Software's Tobias Peciva (of MaxiMice fame) for permission to include the Hover Scroll feature in Smart Scroll. Thanks to Apple for OS X.
Toolbar icons by Eugen Buzuk and Roman Gordeyev (rv.blitz@gmail.com). Scrolling should not transfer to another area when cursor is moved. Bouncing at the end of a document.